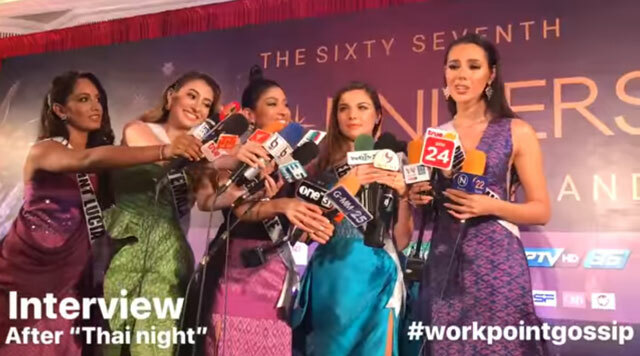 (L-R) Miss Saint Lucia Angella Dalsou, Miss Guatemala Mariana Garcia, Miss Singapore Zahra Khanum, Miss Lebanon Maya Reaidy, and Miss Philippines Catriona Gray meet members of the Thai press at a welcome dinner for Miss Universe 2018 candidates, last Wednesday, December 5, at the Dusit Thani Bangkok. 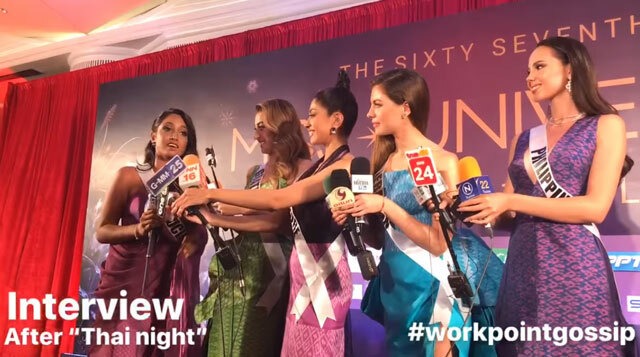 An eight-minute interview with Miss Universe 2018 candidates, including Philippine bet Catriona Gray, is going viral online, not for any negative reason, but for the candidates' eagerness—a better word would be generosity—to help media get a better audio for their coverage. The interview was held at the "Thai Night" themed welcome dinner at the Dusit Thani Bangkok, last Wednesday, December 5. The reporters could not come closer to the candidates, who were then requested to hold the microphones of various network stations. 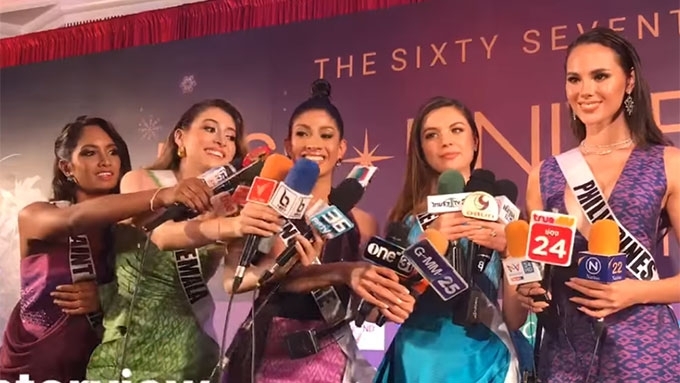 Catriona—along with Miss Saint Lucia Angella Dalsou, Miss Guatemala Mariana Garcia, Miss Singapore Zahra Khanum, and Miss Lebanon Maya Reaidy—held at least three microphones each. And three of them really made an effort to direct the microphones toward the beauty queen answering the questions. 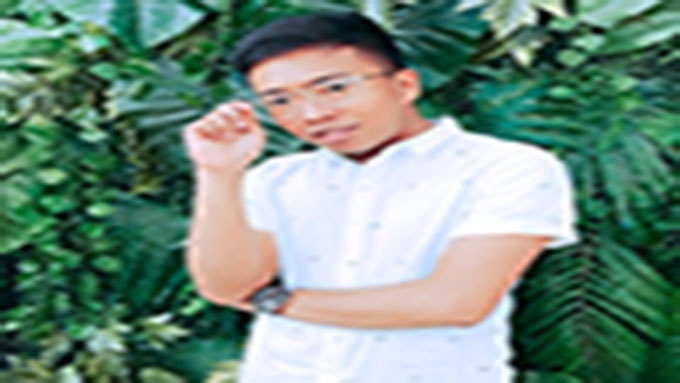 "Wala bang lamesa dun para ipatong yun sangkaterbang mikroponong hawak-hawak nila?" "Why are you torturing the girls by letting them hold the mics for so long and even extending their arms just to give better reports?" "Awkward! Kaloka lang, hawak ng mga kandidata ang mga mics. Pahirapan sa pag-abot sa dulo. Hehe!" 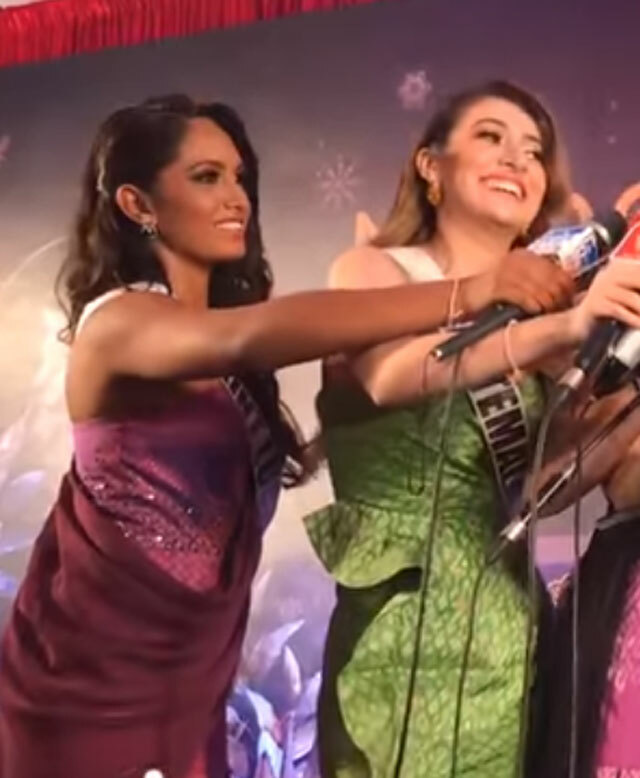 But Miss Saint Lucia Angella Dalsou and Miss Guatemala Mariana García received love from Pinoys for making the extra effort to hold up their mics for Catriona. Meanwhile, Catriona nailed the interview. The 24-year-old Filipino beauty queen was asked about her thoughts on the beautiful creations the candidates wore at the welcome dinner. 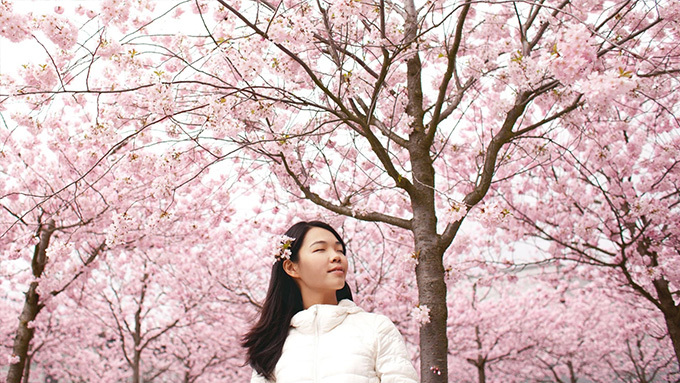 She answered, "I am so honored to be wearing an Asava creation and, of course, Thai silk, which I know has so much culture, and tradition, and love from the Thai people. "And to be coming from another country and wearing these beautiful creations and having them showcased to the universe is such an honor. It's wonderful to be here tonight." Catriona, praising the gowns, also said, "Not only the colors and fabrics are beautiful, but the craftsmanship and how it hugs the figure of every women's body, and it just shows everyone's best asset, and I think every one really felt like a queen tonight in these Thai creations." The grand coronation of the pageant will be held on December 17, at Impact, Muang Thong Thani, in Bangkok, Thailand. Reigning Miss Universe Demi-Leigh Nel-Peters of South Africa will crown her successor at the event.